Image caption France's Figaro sees "Europe in confusion"
The prospect of Brexit-style referendums in other European countries is a major concern of European commentators today, against the background of a growing consensus that the EU needs root-and-branch change if it is to survive this challenge. 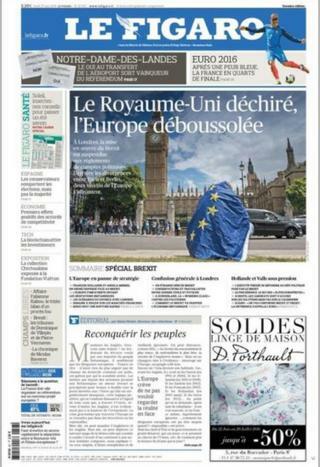 In France, Le Figaro's managing editor Alexis Brezet uses a front-page editorial to call on the EU not only to reform - a common European media theme in recent days - but to rebuild itself through a new treaty that must be ratified by referendums in all member states. He warns France and Germany to avoid the "temptation to try to patch things up". They should offer real protection against the pressures of globalisation, from "multicultural naivety, dogmatic free trade, and abstract universalism" to "uncontrolled immigration, persistent unemployment, and a squeezed middle class". The alternative is to accept that the people will "return to the only protection worthy of the name - that of the nation". He acknowledges the risk of new treaty referendums, but insists that "Europe will not change without the people, and we cannot make them happy against their will". Image caption @alainjuppe: "Organising a referendum on Europe today in France would be irresponsible"
The idea of a specific French referendum plays out in other papers, with former prime minister and conservative Republican party presidential hopeful Alain Juppe firmly ruling it out as "irresponsible". "France has no future outside the EU," he tells Le Monde. The paper's Benoit Hopquin "dives into the France of 'Frexit'", and warns that the contrast between prosperous, metropolitan areas and these "almost nameless towns... with their idling factories and children who've left, never to return", is "similar to the divide in Britain". How does vote affect expats? Liberation interviews the Republicans' deputy chairman, Laurent Wauquiez, who applauds Brexit as a chance to "consolidate the Europe Union around a core of seven to twelve countries that share a common vision... and are ready to harmonise their social and fiscal policies". He thinks EU leaders should acknowledge that a "similar referendum would have gone the same way in any European country, and in France by perhaps a larger margin". Like Figaro's Alexis Brezet, he recalls that the EU "hasn't won a single referendum in 20 years" and needs to move away from neo-liberal economic policies, but in the form of a "two-tier Europe". German commentators agree that the EU's distance from ordinary voters is the issue, rather than the particular attitudes of the British. Die Welt's publisher, Stefan Aust, has no doubt that the vote was a "come-uppance for Brussels, whose policies are ever more impenetrable, and for the high-handedness of a bureaucracy whose decision-making process are increasingly removed from the public". He thinks Britain may have done the EU a favour in revealing the "great project to have been a great illusion, a colourful soap bubble" and in forcing it to decide on whether to accept differences among member-states rather than "fake a consensus". Frankfurter Allgemeine Zeitung's Brussels economics correspondent Werner Mussler demands the resignation of EU Commission President Jean-Claude Juncker for pledging deeper currency union, complaining that his "anti-British passions have made him forget that that the need for 'more Europe' is the last thing that should be learnt from the British referendum". Elke Schmitter of influential news magazine Der Spiegel looks on the bright side, saying that at least there is "clarity now on what it means to be an EU member or not". Georg Loewisch in Tageszeitung agrees that any "New Deal for Europe" must bind its members closer together in a common identity, and that its terms cannot be negotiable. Federico Fubini in Italy's Corriere Della Sera sees the British vote as indicative of a new fault line in Europe "not between left and right... but rather between nationalists and internationalists", those who want to deal with global problems by "raising the drawbridge... or working together for prosperity, culture and our open society". Guido Gentili in the business paper Il Sole 24 Ore does not envy European leaders their task of "reigniting enthusiasm" for an EU whose "wrong or failed answers are at the root of this risky transition". Image caption Italy's Corriere della Sera profiles "Scottish resistance to leaving the EU"
Like his peers elsewhere in Europe, he calls for a "genuine debate based on the disenchantment of European citizens, their questions and their concerns - primarily growth, employment and immigration". Not all commentators are as understanding of the Brexit mentality. A searing piece in Austria's Der Standard by London-based German journalist Sebastian Borger uses a topical footballing analogy. "No football team, no matter how bad its current form, can afford a moaning player who won't contribute, and insists on a transfer but won't leave the bench," Borger writes. "The player has to be got rid of". In Vienna's Die Presse, Wolfgang Boehm is more understanding of the desire for a sense of "safety and being protected", but fears it is ultimately unrealistic. "The dream of total sovereignty in a neatly arranged state is not possible anymore," he says. "The British are dreaming of going back to the 18th Century." Further down the Danube, legal analyst Tamas Adany does not expect Britain to receive much sympathy in the eventual negotiations. He tells Hungarian conservative daily Magyar Hirlap that EU states "don't want an easy or comfortable divorce, to avoid making the idea of leaving attractive to any other member state". Czech commentator Ondrej Stindl does not defend the EU elite, but does not spare the "ordinary people" either. "Perhaps the problem is that both sides are in many ways alike - irrational, self-absorbed, with a tendency to groupthink, conformism, and hysteria," he says on the Echo24 news site. There is also deep concern in the media of Eastern and Central Europe at the increase in xenophobia in Britain, aimed in particular at Polish migrants. Image caption Poland's Gazeta Wyborcza warns of a "Brexit trap"
Influential Polish website NaTemat is typical in reacting with shock to anti-Polish leaflets and graffiti, describing them as "just the tip of the iceberg" of a wave of hatred "hitting all migrants". Czech newspaper Tyden also covers the graffiti and attacks, and raises fears that the referendum will "encourage extremist elements in society".